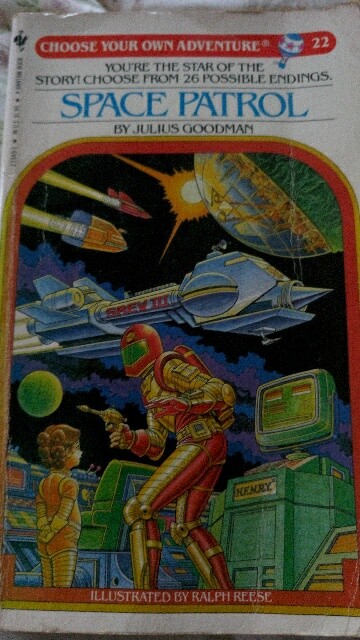 I had a choose your own adventure book when I was a kid that was set on a spaceship. I think you had to battle an enemy and not get destroyed or something. I tried a few times but couldn’t figure out how to win the story. Eventually I just read every page to see what the correct ending should be and guess what? There was no way to complete the mission without something bad happening. Edit: people are asking what the book was, but it was over 30 years ago so I’ve asked my mum to take a photo of my old books to see which one it was. Hopefully there’ll be a mum photo arriving soon. It’s a book with Quantum properties!!! Jokes on you! I’m skipping to page 73! Hah!! I feel like you’d end up at page 72 regardless. Free will or not, doesn’t really matter as it wouldn’t change what decisions you make unless you really absolutely must have control. Reminds me of that new Netflix original Dark. That show is messing with me. This page always gets reposted, yet nobody has ever thought of posting page 72. Instructions unclear. Turned to page 29. Except that modern neuroscience has proved nothing of the sort. Getty Lee is grtting serious! Page 72 better start with you asking John Conway what the hell he’s doing out on a road in the middle of nowhere. So what is on pages 57-71?? I once turned to page 57 after reading this and my book exploded killing my cat in a fireball of claws and fury. My Grandmother lost her eye during all of this from the shrapnel which was the binding. Lesson learned. Turn to page 72. If you have free will, don’t do either of those and just stop reading now. To whom it may concern: I knew you were going to say that. But it doesn’t really matter if free will is real or not as long as you can convince yourself that you *are* free. And most people will always be able to do that as long as they aren’t aware of events that have yet to occur. Even in religions like Christianity it’s not really “free will “that is promised but coerced will. Choose the choice I’ve offered, you have the free will to say no but you’ll also face eternal damnation if you do. I neither agree nor disagree so I am staying here. Is this from an actual book? We must believe in Free Will. We have no other choice. There’s actually 3 options here though. If you agree it disagree go to page 72. If you don’t care (neither disagree or agree) you simply flip to the next page of the book. Thus the joke is ruined. I decided not to turn the page at all. If all of our actions are just mechanisms of a predetermined universe, what gives us the illusion of free will? It’s fun to think about this stuff. Like if you had enough information about the state of the universe as it is right now, and a computer that could calculate the physics, you could determine 100 years from now exactly what is happening in the world, everyone’s name, exactly how many people are on the planet, what business to invest in, what plane will crash, etc. Our brains and decisions aren’t magic. They’re chemicals, and physics. If you know the start, and how things work, then you know what they’ll end up doing. And if you know what they’ll end up doing, you can know the next thought, the next decision, etc. So if you had that computer that could make the calculations, and knew the state of the universe well enough 20 years ago, you’d have known back then Reddit would exist, this image would be reposted, and I’d make this boring comment. This concept hurts my brain. I tell people that because I find it interesting. What I said only breaks down really at the subatomic level when you’re dealing with probabilities. It’s not like an opening line haha if a conversation goes that way I say my point of view. Reminds me of the “decision-making” in Star Wars: The Old Republic… do you want to save this shuttle full of schoolchildren or save your love interest? No matter what you choose, you never see your love interest again and nobody mentions the children again after 5 minutes. I’ve tried to tell people this so many times. That we have no free will and it’s all merely chemical / physical reactions and electrical charges. And if u could measure where every piece matter was and it’s properties such as direction and speed you could tell the future if of course we also understood how everything reacted. I go on and on explaining this in detail how you could tell the future and know everything that has ever happened. No one seems to care though… It’s not their fault they don’t have free will..
then close the book you don’t need page 72. The point of free will is to do what you want. If you turn the page to 57 instead of 72, you already showed that you’ve a free will.